Whether in sports, politics, business or sales, this question is always on the table – What is the difference between winners and losers? Many people spend lots of time and effort trying to determine what the difference is between those people who win and those who lose. Dr. Kanter goes on to define resilience as “the ability to recover from stumbles, mistakes and failures and then bounce back.” Although Dr. Kanter was writing for a wide business audience, we could think of no profession for which her message was more relevant than Sales. Every day thousands and thousands of salespeople must recover from some type of fumble or failure. Some stumbles are brought about by the salesperson themselves because of complacency or lack of skill. Others are due to circumstances outside their control. Regardless it is the salesperson that has to deal with it. They have to get up the next morning and correct the mistake in question and press on to other accounts without missing a beat. That we would say is a pretty good example of resilience in action. 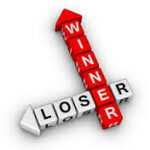 Now, there are numerous factors that can contribute to understanding the difference between winners and losers. We would suggest that resilience is one of these factors and more importantly it is one that has been traditionally overlooked and underemphasized. Define resilience as a skill. A good first step is to stop considering resilience as some nebulous attribute that one either has or they don’t. Instead consider resilience as a skill that can be defined and for which best practices can be codified and shared. Coach it. If resilience is a skill, then it can and should be learned and coached like any other sales skill. In most sales forces it is the rare sales manager that would raise their hand if the question were asked about whether they had help a member of their team to get better at resilience. Reward and celebrate. Sales managers are particularly good at rewarding and celebrating winning and the factors that drive it. So why not include resilience in the mix? If someone bounces back after a bad stumble, give a “tip of the hat” just like one might for any other success. Consider in selection. If you believe the resilience story, ask yourself the question as to whether it should be explored when hiring members of your sales team. To answer the question, take a fresh look at the records of recently hired Millennials – who made it, who didn’t and why – who’s off to quick start – who bounced back quickly after initial stumbles? Lobby to incorporate in sales training. If resilience is part of the key to success and it can be defined as a skill, then why not incorporate improving it into the organization’s sales training curriculum. Today’s market is more competitive than ever. Winning requires a highly skilled sales team. Market leading companies are constantly examining what skills can make a difference – perhaps resilience is an underemphasized piece of the puzzle.